I’m not the world’s biggest Spring/Summer collections fan, I have the kind of complexion that needs contrast… it needs bold colour, the kind that you’re more likely to find in collections released toward the end of the year rather than the beginning. That being said, I’m nothing if not a total sucker for palettes with a delicate amount of sparkle to brighten and highlight. 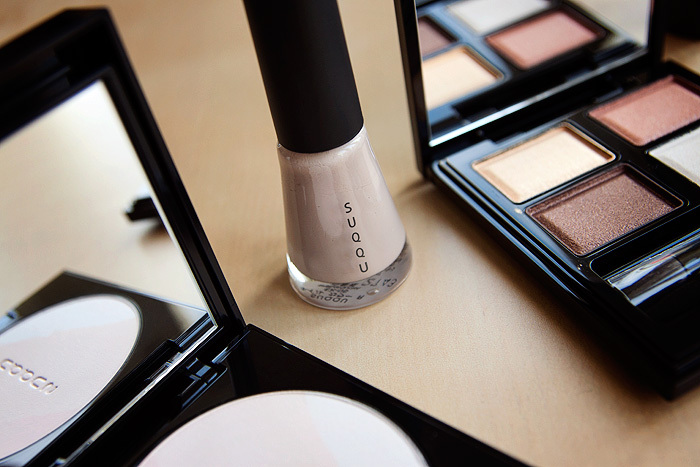 The Suqqu Spring/Summer 2014 Collection* is is my first experience of Suqqu’s colour makeup, it’s not a brand that’s stocked within 80-miles of where I live and when it comes to flying-visits to Selfridges in London, I’ve only ever peeked with curiosity at the much-lauded brush range that the Japanese brand are famous for producing. It’s with this in mind that I’m approaching my post by placing more emphasis on the overall impression of the products, their textures… their longevity and blendability, than I am the colours that come and go depending on seasonal releases. I hope this is ok, I’ve included plenty of photos to show this year’s Spring Summer shades but my curiosity was mostly centred-upon trying to work out for myself whether or not the legendary SUQQU quality lives up to my inflated expectations. 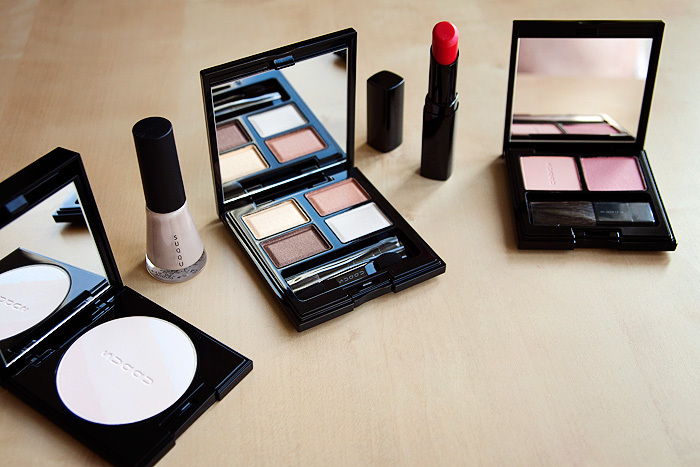 The pieces I received* from the Suqqu SS14 Collection are shown in the photo above, from left to right: Smoothing Face Color, Sirakoucha EX05 Nail Polish, Mitsucha 15 Eyeshadow Quad, Usubeni EX-03 Creamy Glow Moist Lipstick, and Momoshuiro 01 Balancing Cheeks Blusher. I’ll start by focusing on the Balancing Cheeks Blusher (£38.00) below, and will say outright that for me… it was my favourite item in the collection. 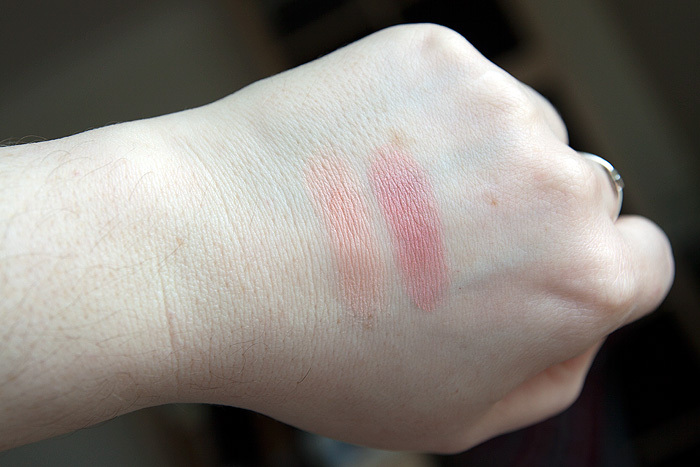 Looking at both the product in the pan, and the swatches on the back of my hand… I was sure that I’d struggle to get the colour to show up on my pale but prone-to-ruddiness cheeks. I was wrong. 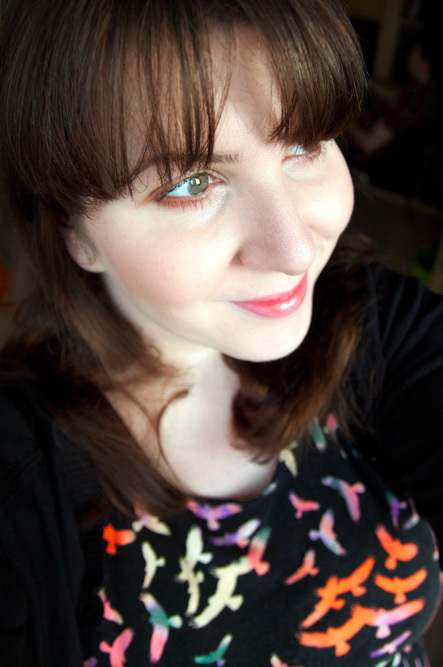 When I’m reviewing something that may end up in someone spending £38 on a blusher, you can be sure that I take my responsibility seriously… and that extends to doing something I might not ordinarily do. I used the cheek brush that comes with the product. Interestingly, so should you. The textures of the blushers are incredibly soft and they kick up a lot of dust… the powder needs the touch of a whisper-light brush, and one is thankfully included in the pan. Infact, despite owning some beautiful, and rather expensive blush brushes… the one that comes included with this duo is softer than anything else in my collection. The colour glides on beautifully. I ended up using the warmer and paler of the two shades in the traditional blusher “stripe” configuration before blending the slightly sparklier pink (pan on the right) into the apples of my cheeks and drawing upwards as you would use a highlighter. Longevity is day-long. I just can’t give any complaints about this product… except to say that it’s more money than I’ve ever spent on a blusher before and I’m just not sure I could bring myself to part with almost £40 for 4g of product. If you could, then you should give the range a once-over on counter. 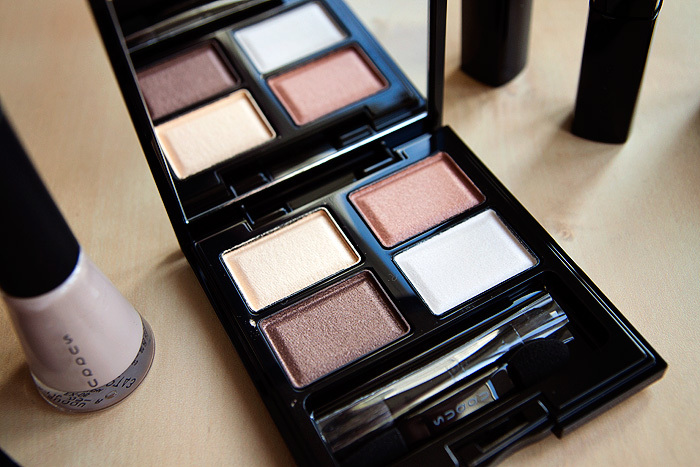 The next item under scrutiny is the Eyeshadow Quad, Mitsucha 15 (£45.00) – a warm-toned palette with an incredible luster and grown-up sparkle. The depth of pigmentation is perfect here, no matter which shade my brush picked up… I felt that I had – as if by voodoo – managed to transfer just the right amount of product from pan to brush each and every time! 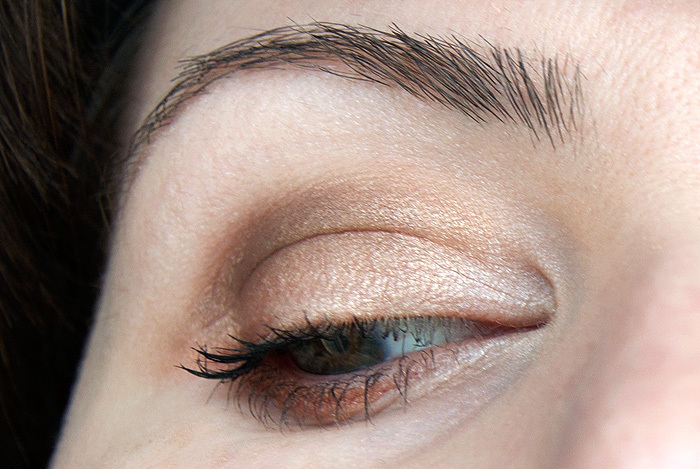 The only occasion I returned to the palette was at the end of my application just to add a little more of the gold (top left) shade to the centre of my lid after blending the crease. Overall, the shades in Mitsucha 15 wouldn’t be my first choice but this is a personal opinion on what suits me. The texture, quality and luminosity delivered by the palette is second-to-none. 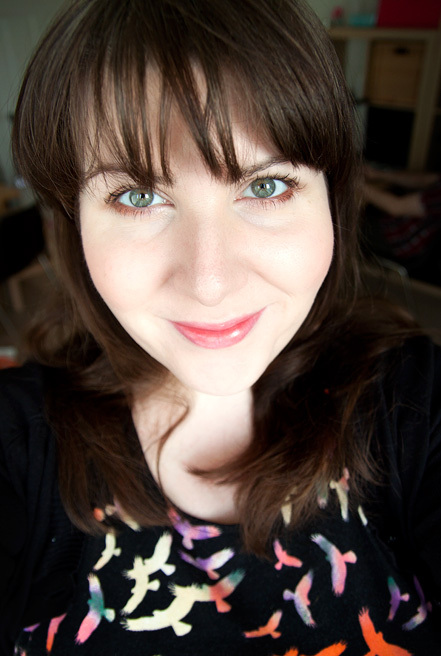 This is grown-up stuff for those of us who aren’t willing to give up on sparkle and highlight but appreciate that our eyelids are a little too mature for the same heavy glitters or metallics that we used to favour. The formula reminds me a little of how the Clarins eyeshadows suit my personal tastes, but with an undeniable added refinement brought about by the fact that with no primer applied, these shades didn’t move a centimetre in over 9-hours of wear. 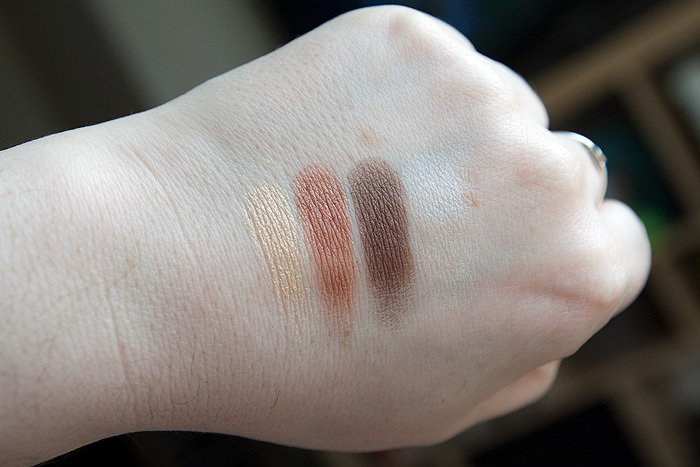 For the perfect quad of shades, I would be willing to part with the £45.00 required to get my hot little hands on the product. I hope you don’t mind but I’ll be covering the SUQQU polish in another post, I’d just freshly painted my nails the day before taking these swatch shots and I couldn’t give up an hours-old manicure just yet! The Smoothing Face Color (£50.00) is an interesting concept, featuring a trio of shades that combine together to deliver a three-in-one solution to help beat complexion imperfections. The white powder on the right contains green pearls to create a “photography reflector effect” diffusing light and blurring imperfections. 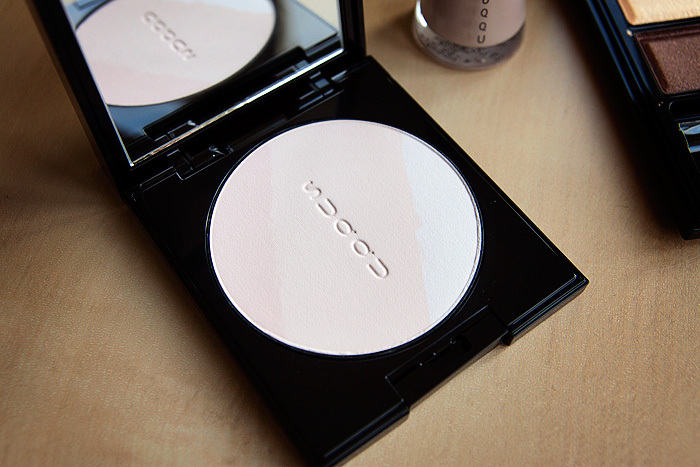 The larger, central beige powder is a finely-milled, non-pearlescent powder that helps create “smooth-looking skin without visible pores”. Finally, the pinker shade on the left aims to correct uneven skintone and discoloration. Ultimately, it doesn’t leave me tempted. 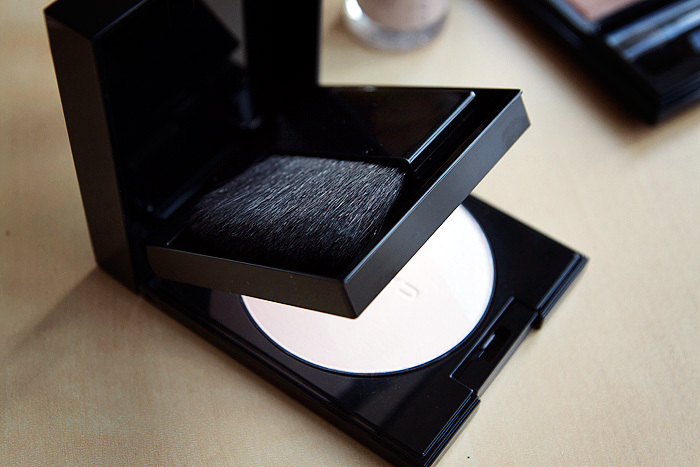 It’s a lovely, lightweight powder that delivers the “smoothing” finish it promises but I just couldn’t justify the price difference between this and some of my other luminosity-delivering finishing powders in my collection. I’m already a huge fan of Guerlain’s meteorites range and Clarin’s regular releases of LE face powders (not the “blush” ones). 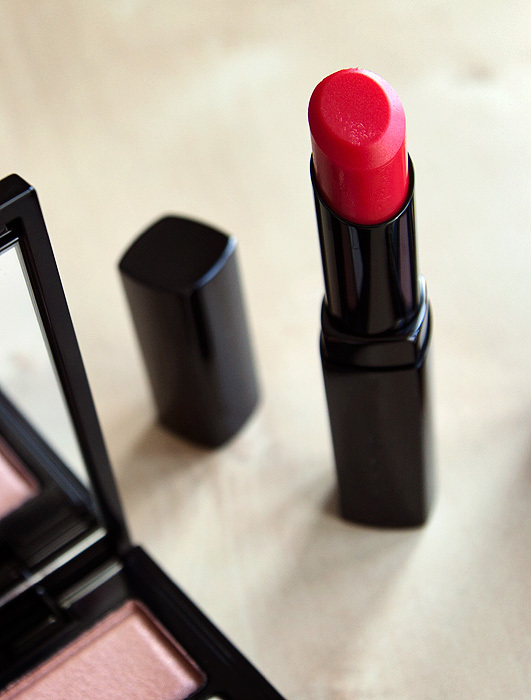 The final piece from the SS14 collection I’m reviewing today is the Usubeni EX-03 Creamy Glow Moist Lipstick (£27.00) with its sheer, balm-like formula. Again, this isn’t one that would tempt me into a purchase, I simply need more pigmentation than this lipstick provides, but if you’re a fan of balms and want a polished-look from a fuss-free formula that genuinely leaves lips feeling better conditioned at the end of the day… I’d make it another one to check out on counter. And finally, a couple of shots showing how the products look once applied. Combined, they achieve a Spring look that is understated but fresh and luminous. I haven’t been disappointed by my introduction to Suqqu. The quality is evident from the first touch… not just in the sleek packaging but in the high-tech textures and long-lasting formulas. The introduction has made me question just how much of my own cash I’d be willing to part with to pay for the kind of quality that a range like this provides… and how much more discerning I’d force myself to be when faced with the prospect of spending £50 on a face powder. Ultimately, it’s a range that is more than worthy of the hype that surrounds it, particularly when it comes to the kind of products that would benefit from technologically-advanced, lighter textures. Next time I’m in London, I’ll be checking out the base products. I see lots of Suqqu bits on Drivel about Frivol’s blog too and I’d love to treat myself. As you say, sometimes the prices are ridiculous (cheek brush, I’m talking to you!) but from your pics, I’d love a custom eye palette – a rust, a light matte taupe, an ivory and a glitter topcoat. Then I’d splash the cash Blush looks beautiful too but I’ve just bought an Inglot one from ebay (shade 70) and it’s perfect for me, don’t think I’ll be switching now. Thanks for the blog post – although it’s a brand I can’t afford, I love to see their products in action. I <3 DaF - everything looks bloody gorgeous on her porcelain complexion! I reckon I'd buy your custom eye palette too! Their foundation is a game changer, crazy price but honestly the only thing I have ever used that looks and feels as though I am not wearing product and mysteriously balances out my patchy pigmentation without looking ‘flat’. 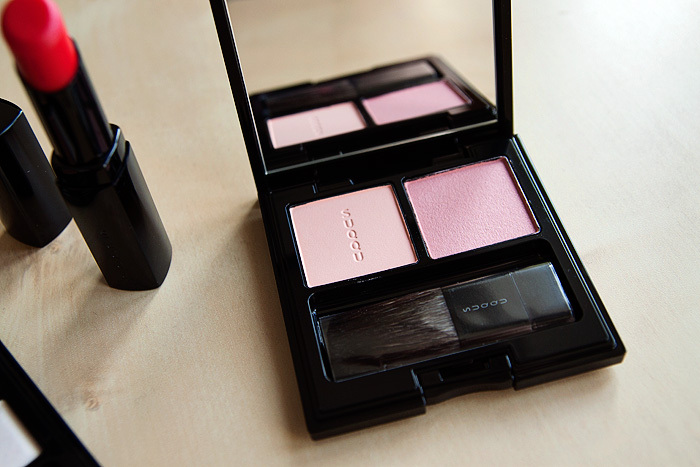 That blush looks perfect! I wish I had £38 to spend on it. I love the look of these, they colors are amazing.